Party decorations supplied by Party City. All opinions are my own. It’s time once again to plan for an upcoming birthday or graduation party. 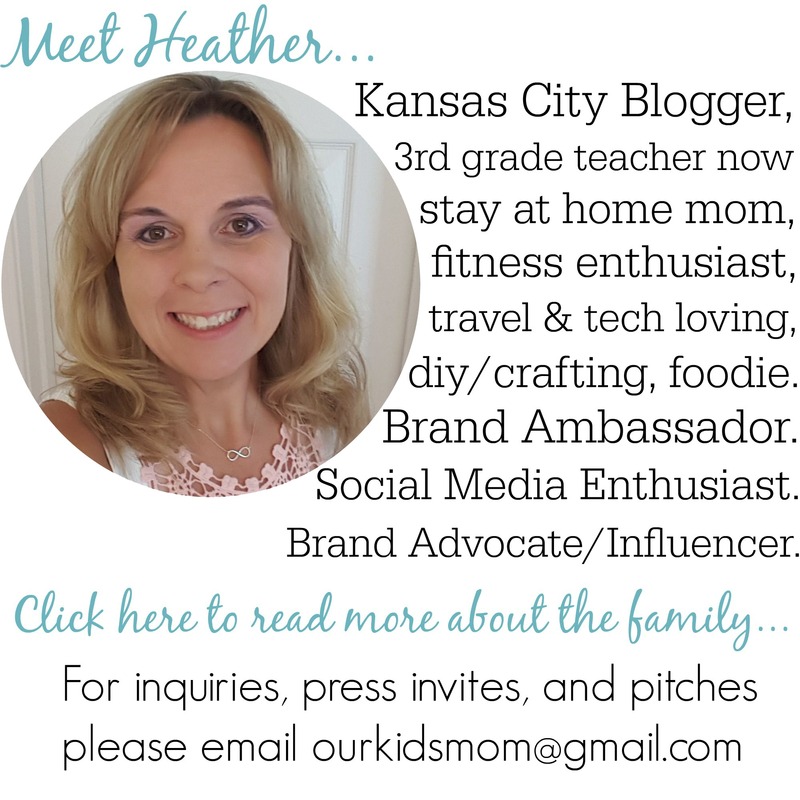 There is so much to do and you are overwhelmed with all of the details. I’ve been there done that. With 23 years of parenthood under my belt and four children, I’ve thrown my fair share of parties. 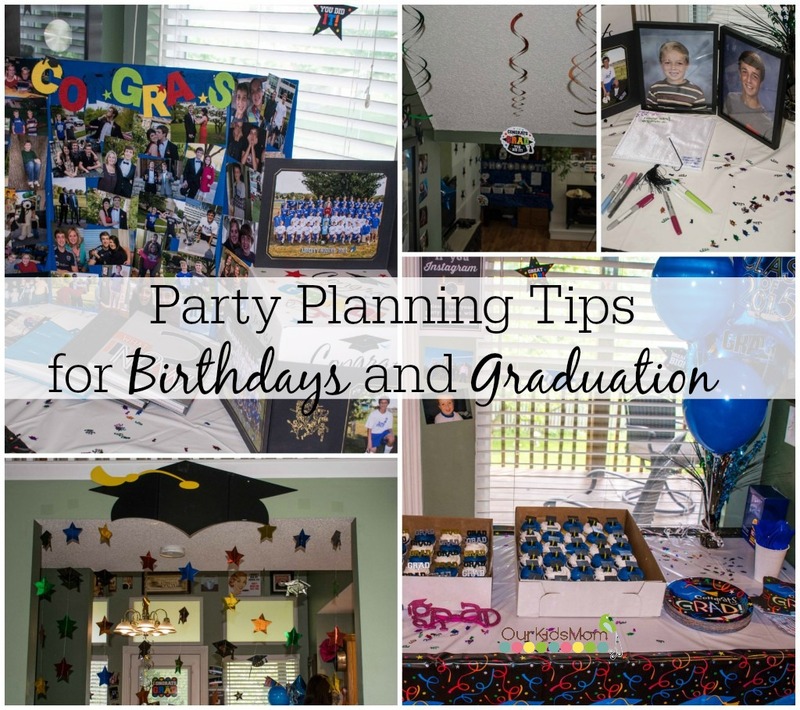 I’ve narrowed down my party planning tips to my top 4 ideas for a successful party. Incorporate these and you’re party will be a hit. 1) Amazing but SIMPLE food. Food is always the first hurdle I tackle. For my son’s graduation party instead of a spread of snacks, we decided to have Chipotle catering as our only food offering. They seriously have something for everyone and our party was scheduled over dinner time. I’m glad we went that direction because it was a huge hit! If catering is not an option for you, try to find a themed meal or snack spread that has offerings for both vegetarians and carnivores. But KEEP IT SIMPLE. The broader your theme the more work it is for you. Pizza is easy and affordable. Pair that with cake & ice cream and you’re done. 2) Inviting Decorations. I feel like decorations set the mood at a party. You want them to be festive and fun… inviting. We picked up many items from our local Party City. 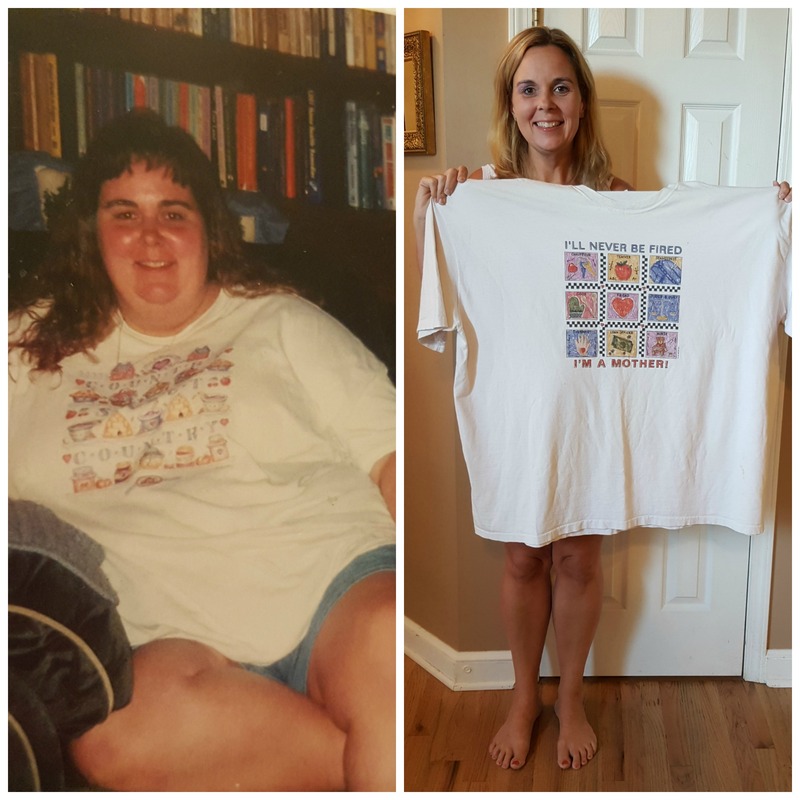 It was so easy… one stop and go! We got balloons, helium, streamers, autograph keepsakes (the graduation cap was a hit but they even have some for birthdays), card boxes, doorway decorations, and the typical tableware like tablecloths, plates, napkins, cups, and plastic silverware. Go a little beyond if you have time! Birthday and Graduation parties are a fun time to display a “through the years” collage. Heck, we ran out of room and started taping pictures of the graduation boy growing up all over the walls throughout the house. So many fun conversations were sparked because of these photos! 3) Fun Activities. 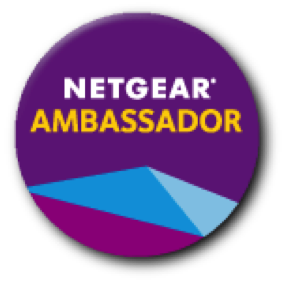 There is only so many people the guest of honor can talk to at once. Give them something to do to enjoy their time at the party. We had Just Dance 2015 running on the downstairs Xbox 360. That pretty much ran throughout the night with tons of giggles and laughs coming from that room. Organized games can be fun, too. The tried and true pin the tail on the “fill in the blank” (usually donkey) or pinatas are fun for all ages. Change up the prizes depending on the age of the guests. Other items like bounce houses, kiddie pools with sand and sand toys, slip and slides, sprinklers, bubbles and sidewalk chalk paint give younger kids something to do that doesn’t need to be guided. 4) Take Pictures. I am the photographer of the family. If I don’t take the pictures, they might get overlooked. 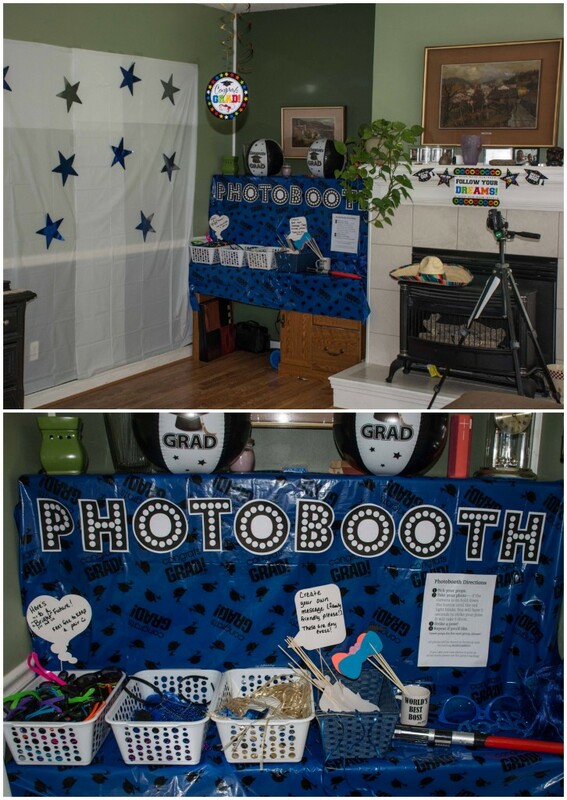 Because I was busy with greeting guests and keeping up with the food, I decided to put together a photo booth. The backdrop was made from two simple plastic white tablecloths and some fun metallic stars. If you want even more simplicity Party City has photo backdrops based on themes for birthdays and graduations. 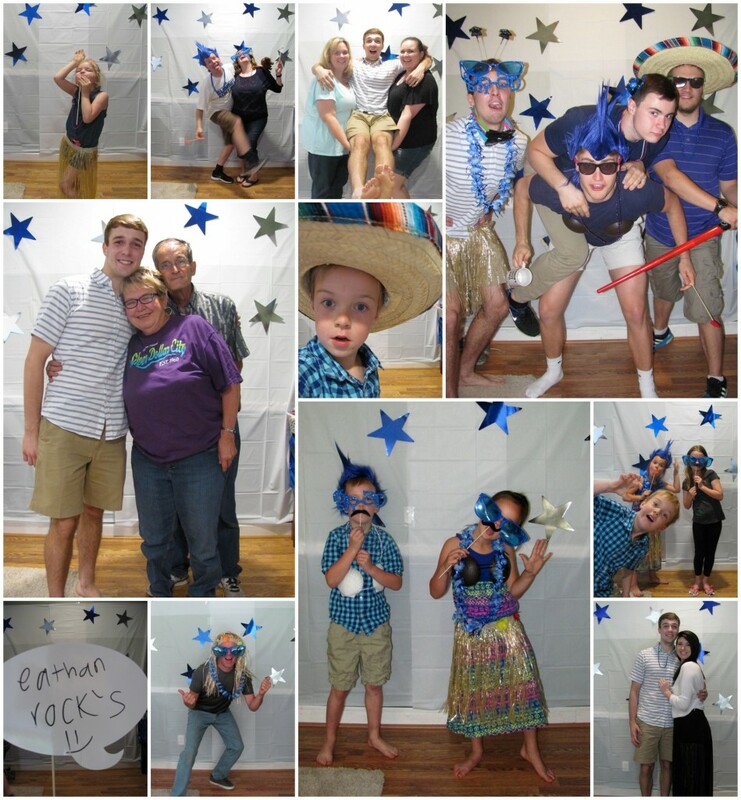 Once we were set up we made sure to create a detailed print out of how to use the camera and how to use the photobooth in general and we let our guests create the memories. GET CREATIVE! We were able to find a few props around the house and the rest we picked up at Party City. From sunglasses and necklaces to Hawaiian skirts, shell bras and blue punk wigs…. I found so much fun stuff I couldn’t buy it all! Make reusable word bubbles on sticks easily. I made ours with laminated paper and kabob sticks. You can “laminate” your own paper with clear shelf paper if a laminator isn’t available. As you can see from our collage, everyone had a great time. We had sentimental photos, silly photos and way out there crazy photos. All of them were keepers and showed the personality of our guests. In the end I had near 200 photos of my son’s friends and family having a great time. We had so much fun going through the photos after the party and I’m sure this is something he will look at a remember often. 5) Social Networking. This means ask other people to take pictures and share them on social networking sites with your hashtag! I got some cool photos this way that I wouldn’t otherwise have seen! 6) Enjoy the party. Try not to make it so oriented around having the planner guide it and just let people have fun. That gives you time to mingle and enjoy yourself as well. There is nothing worse than putting everything away from a party and realizing you spent the entire night behind the grill or herding guests around from activity to activity. Do you have any party planning tips that work for you? Share them with us below! The photo booth with the back drop and props is awesome! Loving that you had Chipotle cater too, did not know they did this. What a awesome set up and party you had! 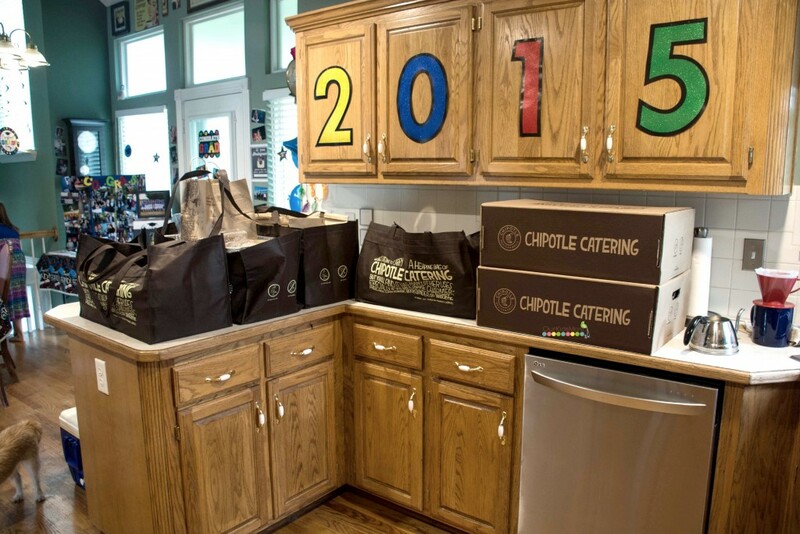 Love the idea of having Chipotle for our next party! Yum! These are really good ideas – it makes me want to put on a party!!! Looks like a really fun party–thanks for sharing your tips!